THE HAGUE, WILLEMSTAD - Environmental organization SMOC has sent a letter to the Dutch Minister Jeanine Hennis-Plasschaert of Defense. In late June she indicated that the Health Department (GGD) will measure the air quality on the island starting early 2016. 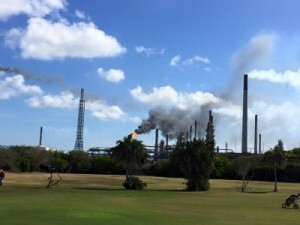 In their letter SMOC demands clarification on the political-administrative consequence for the Isla refinery. Measurements of the air are taken in response to complaints from the defense personnel living in Julianadorp in 2013. The research is conducted by GGD Amsterdam commissioned by the Minister of Defense. SMOC believes it’s a good thing that there are more structural measurements. “This will inevitably entail more incriminating information on the oil refinery,” said SMOC. However, the organization wants to point out to the minister that there is already a lot known about it. Thus, the report Economic Value of Strategic Options for Refineria di Kòrsou of the European consultancy and research firm Ecorys proved that regrettably, every year, there are at least eighteen premature deaths in the shadow of the Isla and that thousands of people have to rely on health care, SMOC writes in the letter. This report, however, has so far had no effect on the refinery. “The Isla has never been called to order,” said SMOC. The environmental group wants to know what the steps are that Hennis-Plasschaert will take after the new measurements are known. Hennis-Plasschaert, has sent the letter to Ben Whiteman, Minister of Health, Environment & Nature, President of Parliament, Mike Franco, the Permanent Committee for Kingdom Relations, Minister Ronald Plasterk of the Interior and Kingdom Relations and the Permanent Committee for Defense.